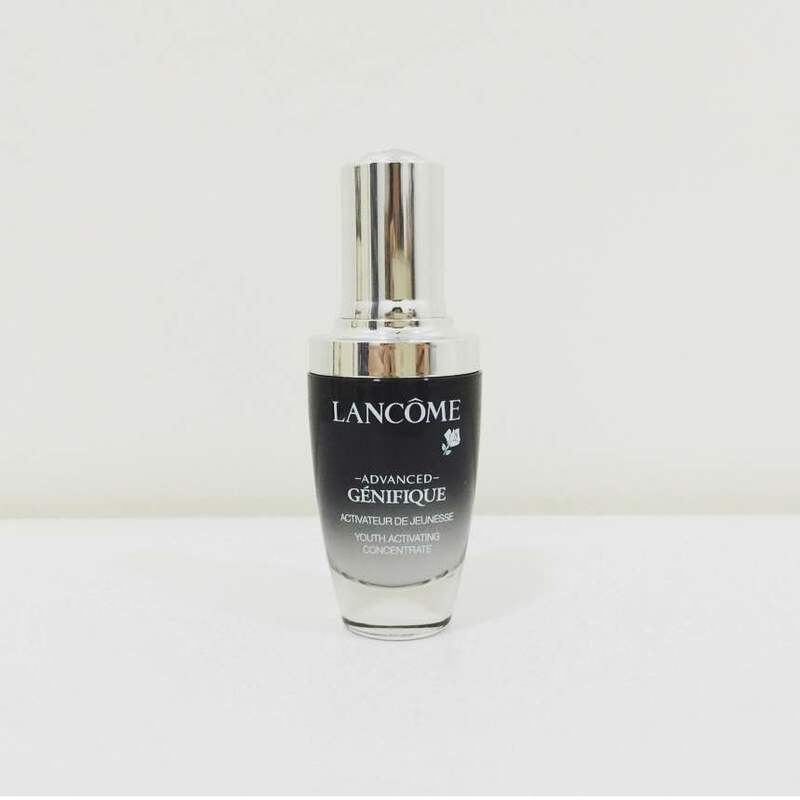 The Lancôme Génifique Youth Activating Concentrate (GYAC) is one of the most raved about face serum in the beauty community. I remember when in Hong Kong, the underground MTR advertisement panels were filled with information and photos of the Lancôme GYAC. That's not all, while at Sogo Causeway Bay, the Lancôme promoter gave me a pack of one week supply of the GYAC to try out. 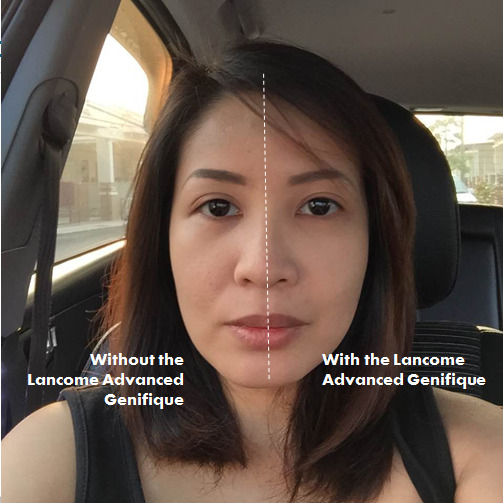 Last week I received the full size bottle of GYAC from Lancôme and this time I took extra initiative to test out the efficacy of the product. I wanted to know if the GYAC is worth the praise that everyone's singing and whether it can really restore the youth of our skin within one week as Lancôme claims. So I tried it on half of my face to see the difference. The scientific discovery: Inspired by the latest discoveries in gene science, our research laboratories have revealed more about key skin functions that help to maintain its youthfulness. With age, this functions are altered and the recovery ability decreases. Enriched with new active ingredients, Advanced Genifique has been formulated to boost visible signs of youthfulness and to help skin's recovery during the day and night. From the first drops, skin looks smoother and more luminous. In 7 days, it looks younger, feels rejuvenated. After 8 weeks, 10 key signs of youthful looking skin appear improved: proven in clinical testing under dermatologist control. After cleansing and toning, apply three drops of the GYAC onto your face. Seal it with another layer of moisturizer or face cream. For better result, exfoliate your skin twice a week and apply it on top of your face essence. I've been using it on the left side of my face for the past one week - day and night. Every morning when I wake up, there is an obvious difference on the left side of my face. The lines (worry lines, crow feet, nasolabial folds & smile lines) on the left side is significantly lesser. 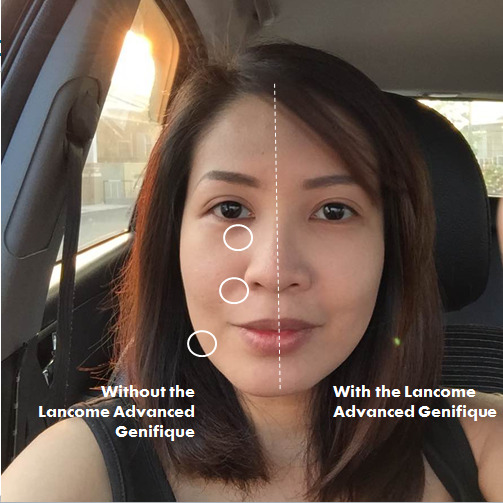 Although Lancôme claims that the result can be seen in a week, for my case I can see the result in just 3 days especially on my nasolabial folds. The left side of my face is lifted and look less tired compared to the right side where I don't put on any product during the trial week. The three points that I can see a dramatic change are on my nasolabial line (the line extend from the side of our nose to the cheek), the under-eye area and my cheek. My face looks lifted where I applied the Lancôme GYAC. Lancôme put a lot of thoughts on the packaging. I love the dropper. It allows me to measure the right dosage to use. Half the dropper is enough for the entire face. You just need one squeeze for one day usage for day and night. I love the fine texture. It feels light on the skin and can be worn underneath the makeup during the day. It's in light liquid form (similar to essence) and gets absorbed into the skin almost immediately. When I recommend this to my friends, all of them mention that the price is too steep. The price tag can be a turn off, however if you use the recommended dosage, the 20ml bottle can last up to two months. I would recommend this for anyone who experience pre-aging stage. If you are looking for quick solution to sagging skin and want to increase the firmness of your skin, this is the product for you. 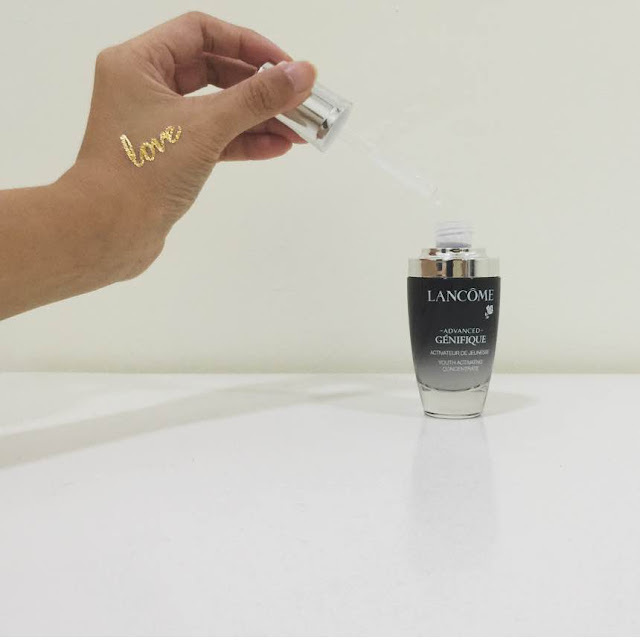 Visit any Lancôme counter and get a one week trial of the Lancôme Génifique Youth Activating Concentrate (while stocks last).